Two-story brick building erected as a memorial to World War I veterans. Dedicated to those who fought for their country in World War I. The only monument to “The War to End All Wars” in Osborne County. Cornerstone laid July 27, 1922. Opened February 15, 1923. 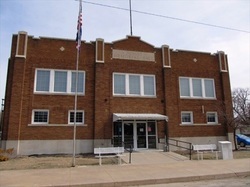 500 Morgan Avenue, Downs, Kansas. 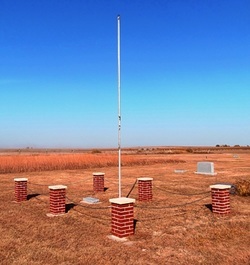 Brick and concrete monument erected in the early 1960s in rural cemetery located four miles south, one mile east, and a half mile south of Downs, Kansas. Given to the city of Osborne by Mabel Hardman in 1959 to be forever used as a park. A living memorial to the Veterans of Osborne County who served so valiantly in all wars, that you, who enjoy these facilities in peace, may pause for thought and meditation on the sacrifices they made to insure your right to do so. Land for park donated by Mrs. Dwight Hardman as a memorial to Dwight H. Hardman, 1897-1955, Lt. Comm. U.S.N. Ret., Veteran World Wars I & II. Erected 1959 by Mrs. Dwight Hardman, American Legion, VFW, and City of Osborne. 659 North First Street, Osborne, Kansas. The African black marble obelisk with grey granite wings monument cost of $23,000 and was dedicated on November 11, 2000. Dedicated To All Veterans Who Called Osborne County Home. All Gave Some, Some Gave All. 423 West Main Street, Osborne, Kansas. The photographs of all Alton area military veterans from 1870 to the present day adorn the south wall of Hardman Hall, home to the American Legion post in Alton. Put in place in 2013. 613 Mill Street, Alton, Kansas. ​Bronze elk statue and wood framed list. Dedicated in May 2015. NW corner of Mill and Nicholas, Alton, Kansas. ​Closeup of wood framed list of all Alton area military veterans from 1870 to the present day. The bull elk sculpture in this park is dedicated to the honor of our veterans who have served our country. The bull elk is in recognition of Alton’s first veteran, General Hiram C. Bull.